The ageless Venus Williams launched her 25th year as a professional by outlasting Victoria Azarenka in a three-set thriller on day two of the WTA Auckland Classic Tuesday. In the showdown between the two former world number ones, the 38-year-old Williams overcame Azarenka, nine years her junior, 6-3, 1-6, 6-3. The two hour 10-minute marathon was packed with power and precision, and in the end Azarenka’s nine aces were not enough. Williams’ superior accuracy in the opening stages gave her the first set, before Azarenka took the second by blasting winners as she moved her opponent from side to side. In the deciding third set there were two breaks by each player in the first six games before Williams opened a gap to go 5-3 up when Azarenka was wide with a cross-court forehand. The American then served for the match. “I love my job, I love what I do but tonight was not easy and maybe one of the toughest first rounds I’ve ever played,” Williams said, adding it was what she needed to start the year. “My goal was to get past the first round, did you see who I had to play, and we need these matches going into the Australian Open,” she said, referring to the year’s first Grand Slam which begins in just under two weeks. Defending champion Julia Goerges coasted through her first match with a 6-0, 6-4 win over Sweden’s Johanna Larsson, while fifth seed Barbora Strycova was forced into a three-set battle to survive Taylor Townsend. Strycova raced to a 5-1 lead over Townsend before the American lifted her game to force the match to a deciding set in which the Czech prevailed, to win 6-2, 6-7 (5/7), 6-3. “It was very tough, I thought I was playing well at the beginning and she couldn’t find the court in the first set,” Strycova said. Fourth seed Petra Martic and injured eighth seed Alison Van Uytvanck both bowed out in the first round. American Sofia Kenin produced the first upset of the tournament when she knocked out Martic 7-5, 2-6, 6-2. Van Uytvanck retired with an ankle injury when leading Dutch qualifier Bibiane Schoofs 4-3 in the first set. Top seed Caroline Wozniacki will make her first appearance on Wednesday after a weather-delayed flight from Florida saw her match against Laura Siegemund of Germany pushed back a day. 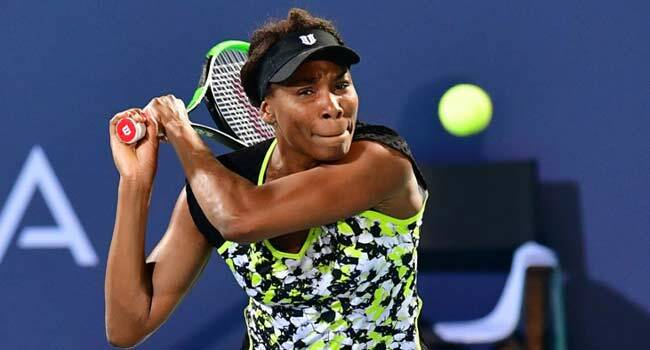 The post Venus Wins Three-Set Thriller Against Azarenka appeared first on Channels Television.